The most difficult time in my life I was doing what I want. As I write about all the time, I had left Carlyle to write my first book, only to discover that my mind wasn’t fit for the task. In leaving a job that I didn’t want, I figured that once I was doing what I want, I would feel amazing, but again, I was wrong. Truth is I should have learned this lesson sooner. Some six years earlier in leaving Goldman Sachs to do what I want, I found it wasn’t all I had dreamed it to be. For a few months freedom felt free, but soon after my brain moved onto Now What? But for the first time I was starting to see through the veil. Sadly, most of us humans only learn these lessons at the end of our lives. “Spending” our lives looking forward to retirement, or sitting in a lame job dreaming to quit, we convince ourselves that the grass is greener. We know it never is but it’s still easy to be fooled by that brain. And what I had stumbled upon would come to transform EVERY SINGLE ASPECT of how I live, but I still wasn’t ready to learn the lesson. Back then I was still all about getting and doing. If ONLY I could feel amazing, then I could be “doing” the work I want, on track to “getting” what I want, which would lead me to feel amazing! See, even some 11 years into this work, having read thousands of books, and literally devoted my entire life to these topics, my brain still failed to get it. I had transformed my life from working poor Australia to doing what I want, yet my brain still thought it needed that next thing to feel amazing. The cause and effect is wrong. When, really, we can train ourselves to feel amazing at will. I discovered the truth about how we feel. How many of us have those things that we say we want only to get or do them and discover they don’t feel as amazing as we imagined? That great job. Marriage. Money. House. Car. Even kids. In the backwards field of psychology which has little clue of how to get people feeling amazing, it’s well accepted that kids make us “less happy,” (less pleasure, more meaning) but, ultimately “no thing” can “make us” feel happy or sad. Most of my life was about getting somewhere or something, or doing those things that I thought would lead me to feel amazing. These days I no longer live that way. I’m still obsessed with how we get and do what we want, but I no longer confuse that as a cause of how we feel. How we feel has, literally, NOTHING to do with what we get or do, and everything to do with how you use your body and mind. Feeling amazing doesn’t require getting or doing what we want. Being our best. Being loved. Respected. Laughable ideas like “Self-esteem.” Being religious. Having a community. Kids. Money. Success. Or anything else. It doesn’t require meditation. Or practicing gratitude. Or journaling. Or affirmations. Or hypnotizing the crap out of yourself. Or finding meaning. Or changing how you think, or changing anything for that matter. 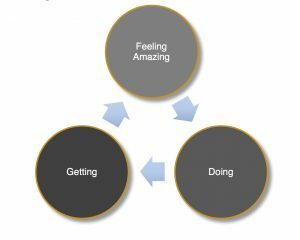 The tools I’ve built over the last 8 years for feeling amazing at will—e.g. The Cure, The Formula, House of Flow, Worry Destroyer, Mind Champ, BSG, Shake and Wake, 10Step, Limitless 3 Step, and dozens more— are so ridiculously simple because feeling amazing at will is ridiculously simple. If you don’t believe me jump up and down for 3 minutes like you won an Olympic Gold and you quickly prove to yourself that no matter what’s happening in your life, you can feel amazing at will. Some people might say, “But that’s not real, I didn’t win an Olympic Gold,” and that’s my point—the brain has rules for what must happen for us to feel amazing, and it’s wrong!